Since 2012, my 4th grade students have created book trailers for favorite novels. In the past four years these student trailers have had thousands of views. 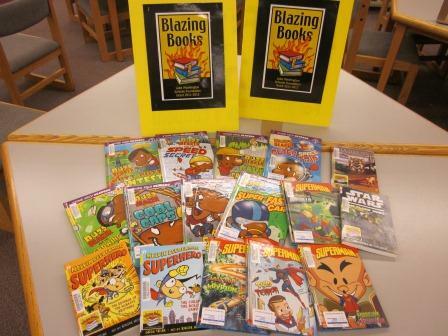 Video is an amazing way to promote reading and advertise fabulous books to other students. We’ve also had the ability to connect with students around the world. For the past two years, we’ve partnered with Angels Soriano in Valencia, Spain. This year her students made hand-drawn book trailers of local fairy tales in their native Catalan language. You can view them here. Here are the latest book trailers we have published. The students made them on Photostory3, which is a Windows 7 program for the PC. 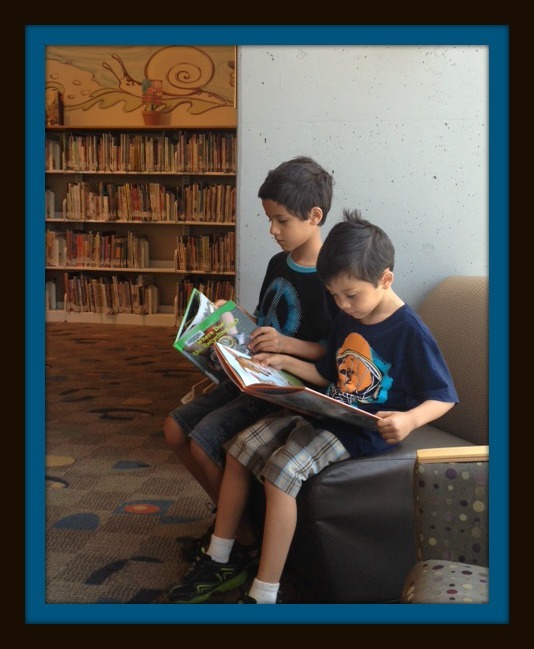 I hope they inspire you to go to your local library this summer and check out these books for some fun summer reading! If you would like to read more about the trailers we have completed in the past with Angels Soriano, this Sway showcases our program in the 2014-15 school year. You can also find our complete list of book trailers at the top of this website on the Book Trailers tab. Reese was doing some newspaper reading this morning. 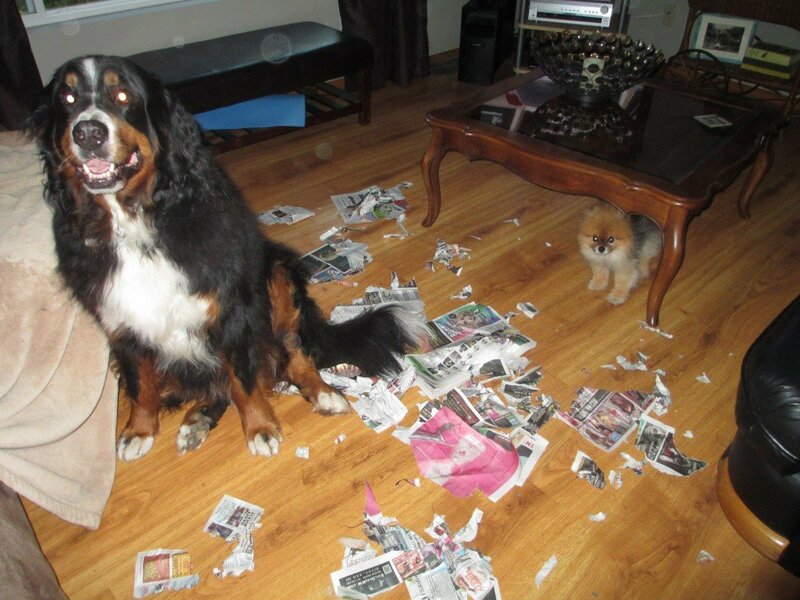 Apparently he didn’t like what he read, so now we have a shredded mess all over the living room floor! Nice! Well it’s Saturday and I have been doing some reading since school let out.After reading Destiny Rewritten, I decided to move to some new chapter books that younger readers would enjoy. 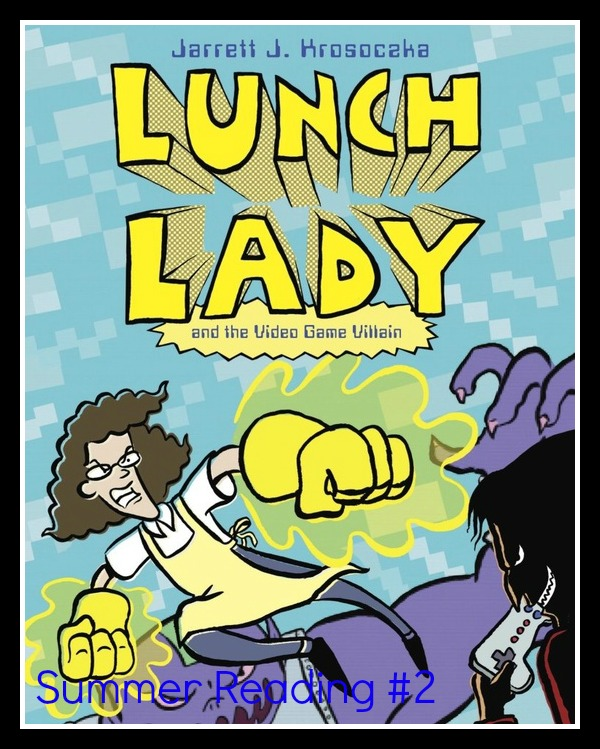 You can’t go wrong with any of Lunch Lady graphic novel series. This time a terrible technology villain invades the school and steals everyone’s gizmos and gadgets. Yikes! Will the Lunch Lady solve the dilemma? 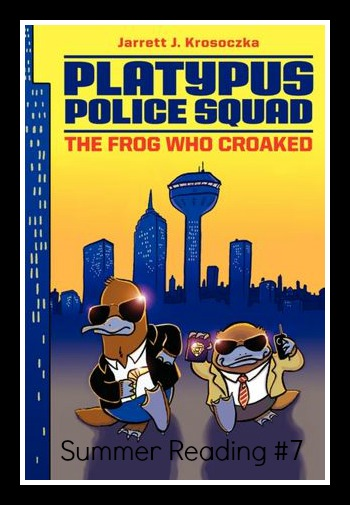 Jennifer S. Holland has a new non-fiction series perfect for kids just starting to read chapter books. 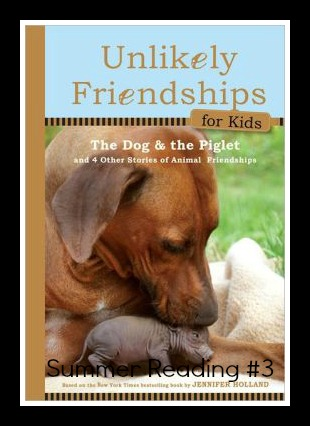 If you like animals, you will love these short stories about the friendships between some pretty unlikely animals. 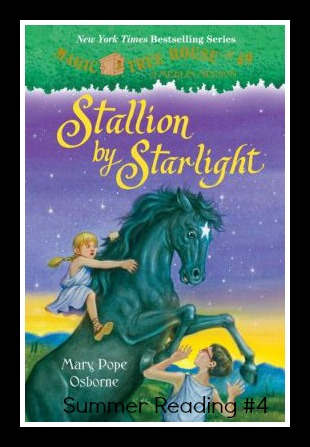 Magic Tree House fans will like book #49 Stallion by Starlight. This time Merlin the Magician wants Jack and Annie to find the secret of greatness. What makes a person great? To find the answer they travel back in time to ancient Macedonia to meet Alexander the Great and his famed horse Bucephalus. 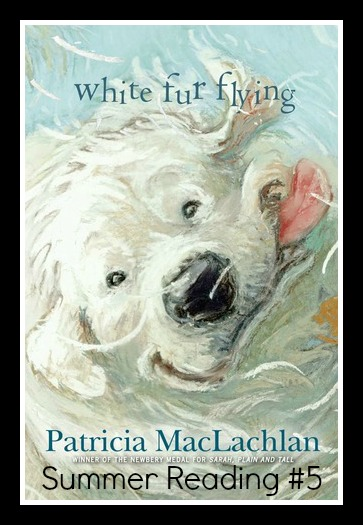 Newbery winning author Patricia MacLachlan’s new book is perfect for dog lovers. Zoe’s mother rescues Great Pyrenees dogs. “Pyrs”, as they are called for short, are large, yet gentle 140-150 pound, white fur dogs. When Phillip moves in next door, he becomes friends with one of the rescue puppies. Will the puppy help him speak again? 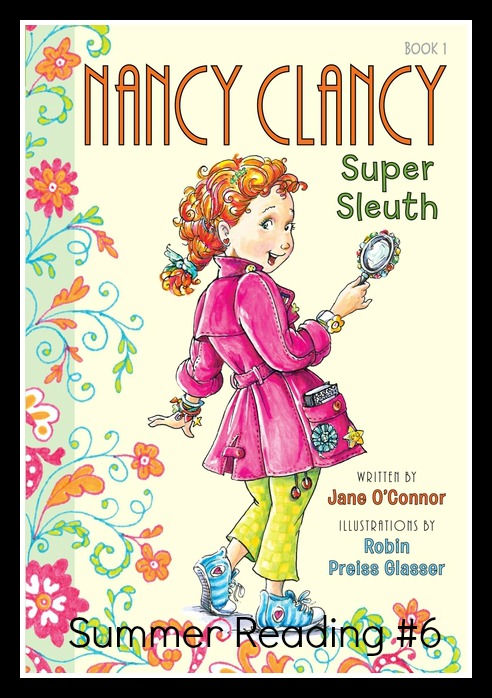 Any girl who loves the Fancy Nancy books by Jane O’Connor will adore her newest chapter book series. A little bit fancy, a little bit Nancy Drew, and a little bit mysterious fun, these books will entertain transitional picture book to chapter book readers. 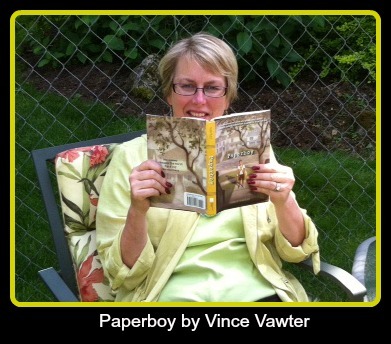 Mystery fans will love the funny new mystery series by the author of the Lunch Lady series. The author Jarrett J. Krosocaka will be our featured guest author next year, so make sure you keep up with all of his latest books! I hope these books will give you some ideas for the upcoming weeks! Tomorrow I’ll be traveling to San Antonio, Texas to attend the ISTE technology conference! I’ll be going to classes and finding out all sorts of different ideas to use in our library lessons in the fall! Look what came in the mail from Australia! That’s right, two books and a wonderful note from Miss Y in Melbourne, Australia. She is a librarian at the St. Martin of Tours Primary School. 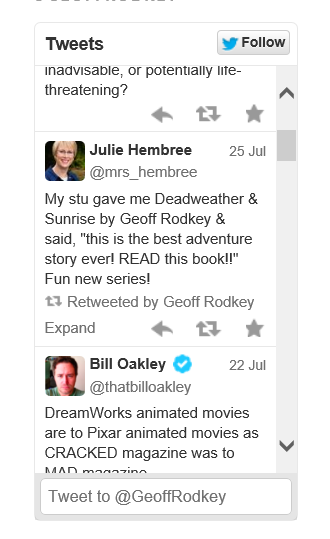 We have been blogging buddies for over a year now, exchanging ideas for books back and forth. I think these books sound like some crazy fun. 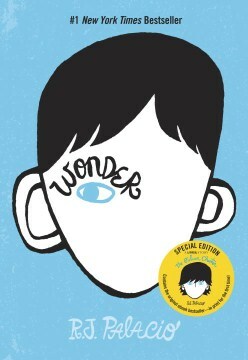 If you are in 3-5th grade, this might be the just-right book for you. Stop by the library and put in your reservation. They will be available for check out early next week. It’s been quite a week for connections. First a phone call from New Zealand and then a package from Australia. I love these reading connections! 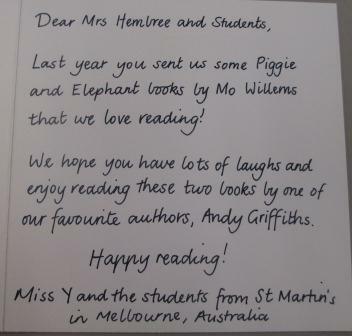 Miss Y’s students have been enjoying some Mo Willems books we sent her last year and now we have some Andy Griffiths books here! It’s a full circle of reading fun! 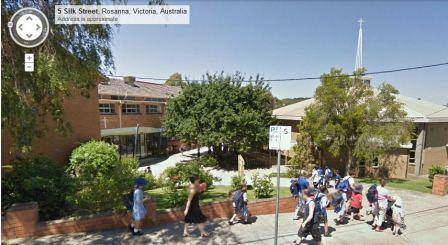 Here’s a photo of what the school looks like outside, courtesy of the magic of Google maps! I hope you will visit Miss Y’s LRC blog soon and leave her a comment. I just watched a new book trailer she made about a new book in the Clementine Rose series for girls by Jacqueline Harvey. 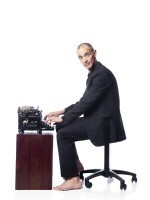 This is the author of the Alice Miranda books we already have in our library! Jacqueline visited Miss Y’s school last year. Here is the post about this visit. 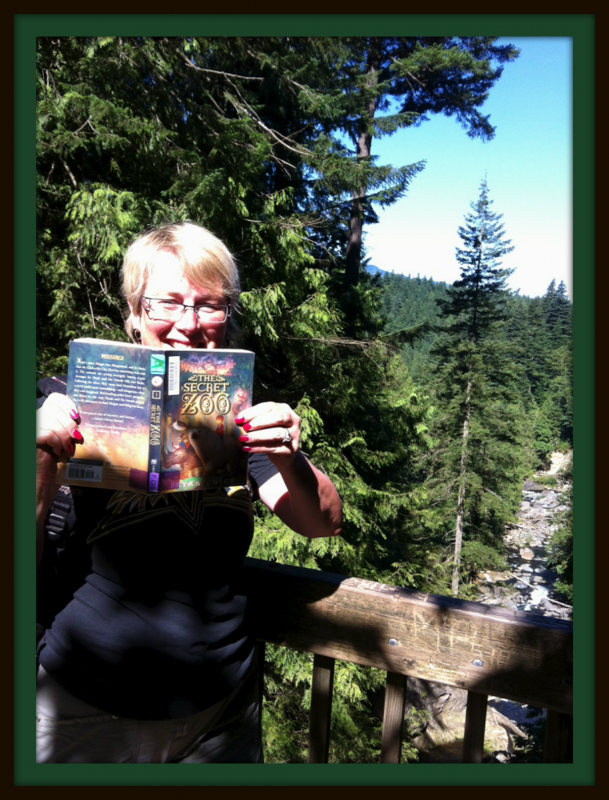 I sure hope if Jacqueline ever visits the Pacific Northwest on a book tour, she will stop by our library! What do you think about our surprise package? 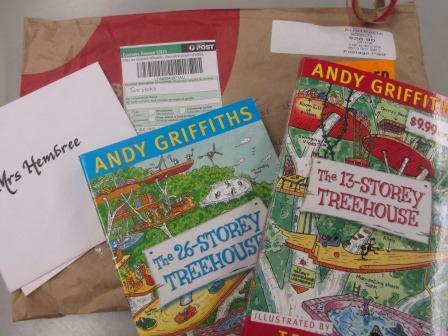 Have you ever read any Andy Griffiths books before? 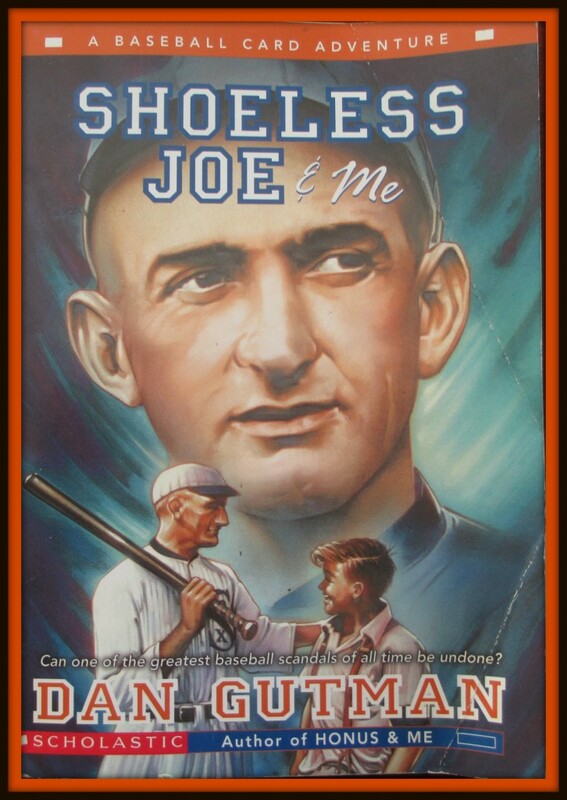 Look at the title.What word do we spell differently? On Tuesday, the Read Aloud Club Kids chose Bigger Than a Bread Box as their next choice for me to read during our read aloud recesses. 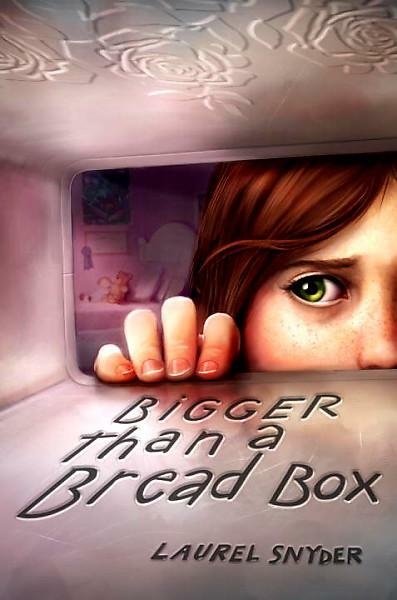 Bigger Than a Bread Box is the story of 12 year old Rebecca who is forced to move to her grandmother’s house in Atlanta with her mom and little brother while her mom tries to figure out her marriage. Dad is back in Baltimore along with all of her friends and everything she’s ever known. Rebecca is angry, confused and alone when she finds a magic box in the attic of her grandmother’s house. A box that delivers her wishes. Like better jeans, and a new watch and new tennis shoes. She gets everything she wants, except her dad. Is having stuff enough to make Rebecca feel happy again? We will read Bigger Than a Bread Box to find out! 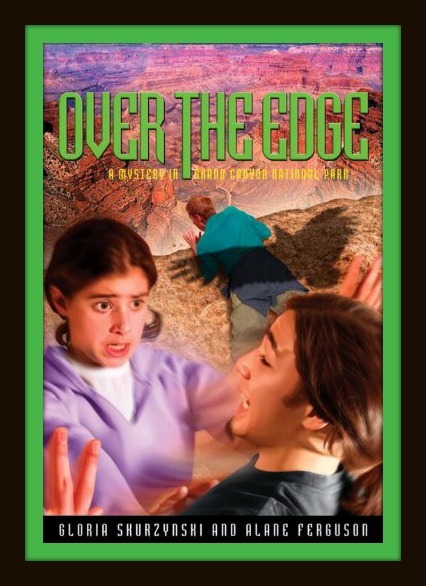 Watch the book trailer by Lily, age 12 who made the trailer with a Canon SD 1300 Digital Elph camera and iMovie. The kindergarten-3rd grade students are starting Read Aloud Tuesdays too! 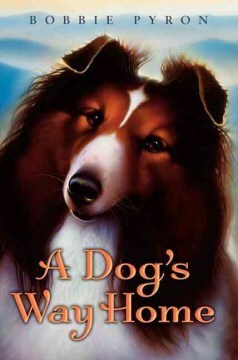 From 12:30-12:55, Mrs. Hembree will be reading a chapter book to the younger students. We have something for everyone in the cold, wet, wintery months! The men and older boys always go on a Dragonquest each year, but Darek is still too young to go. When they come back with a Great Blue, the largest and fiercest of all the dragons, Darek discovers a baby dragonling in the Great Blue’s pouch. He decides to take the dragonling back to the fearsome Valley of the Dragons. 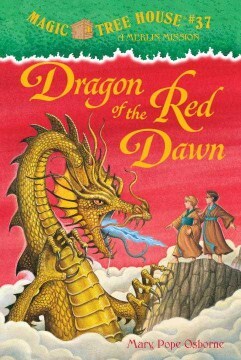 Dragonling is a moving and adventureful fantasy story, perfect for younger readers. 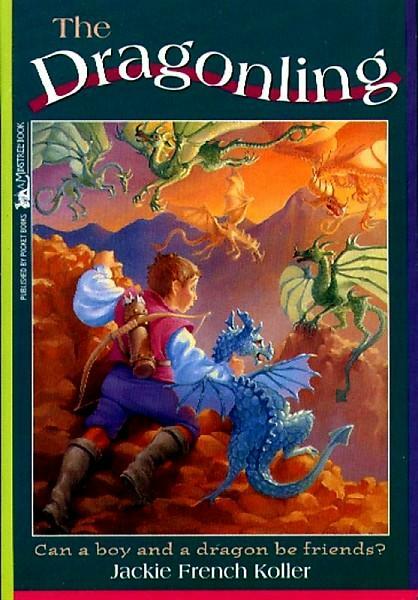 It is my personal favorite for introducing readers to the fantasy genre. So, remember, come on Tuesdays to the library for your chance to get out of the rainy, cold outside and into a world of books! What would you wish for if you had a magic bread box? What is the best book you’ve ever heard? 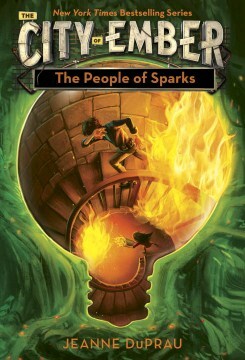 New Year 2012 = New Books! The Bulldog Readers wish you lots of reading happiness! What better way to launch a new year of reading than with new books? 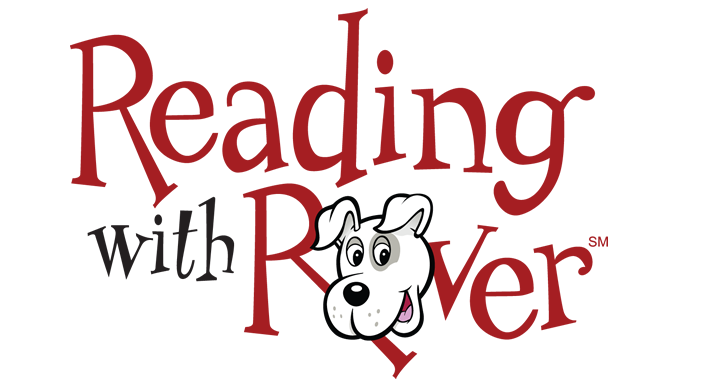 The first group of books was purchased with funds from Reading with Rover. 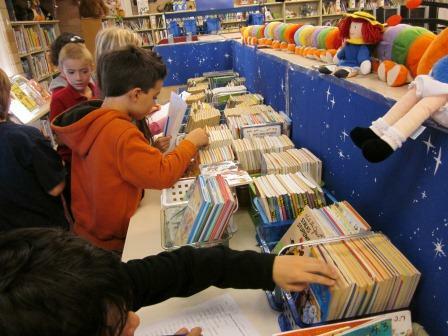 Reading with Rover donated $250 to our school toward purchasing books for reading. It was their way of thanking Mrs. Daly and myself for our commitment to Reading with Rover with our dogs Jett, Silas and Reese. I spent my portion of the money on new library books! 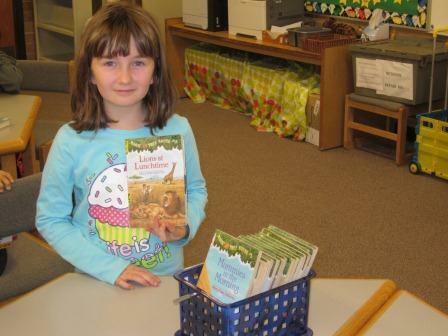 I couldn’t forget our older readers, so they got a new stack of books too! Who knows? 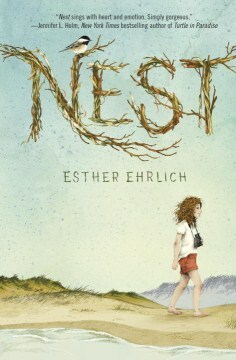 Maybe one of these will become the next Newbery Award winner for 2011! Have you read any of these new books already? Which one do you want to check out? Do you have any suggestions for us to buy? 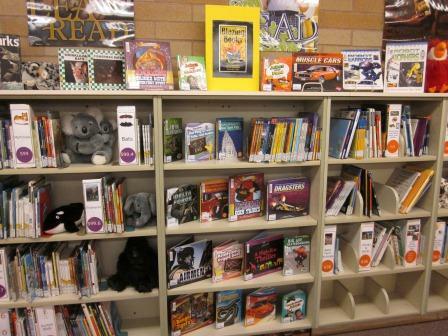 Finding a perfect book to read is as easy as looking in a …..
Our early chapter book readers don’t have any trouble finding books to read because we have them all in baskets where they are easy to find! 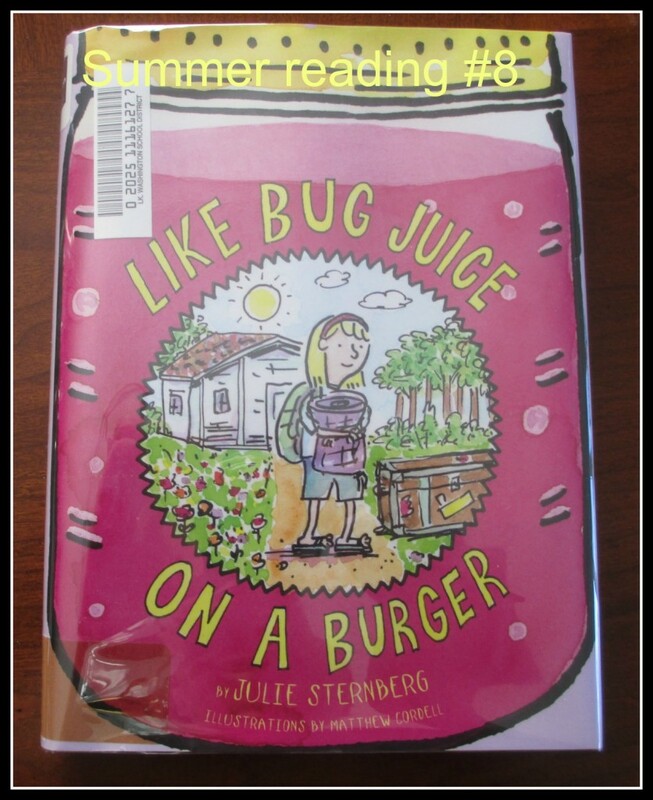 Like Junie B. Jones? Find the basket? 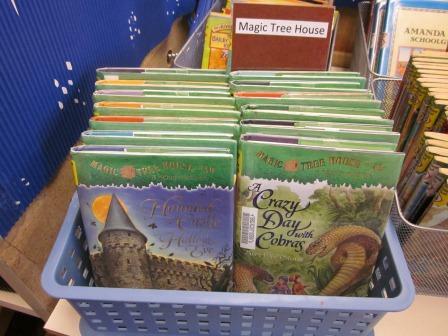 Like Magic Tree House? Find the basket! It really is easy as one, two, three! In class we also have done lessons on all of the easy chapter book series available in our library! 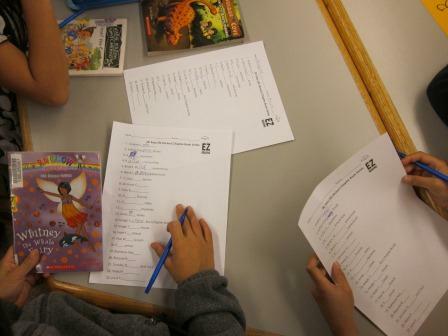 Using a worksheet with only some of the letters of book series typed in, students had to sleuth out the answers! What is your favorite early chapter book? 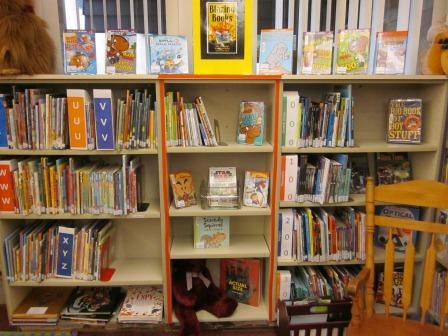 How do you have your books arranged in your library? 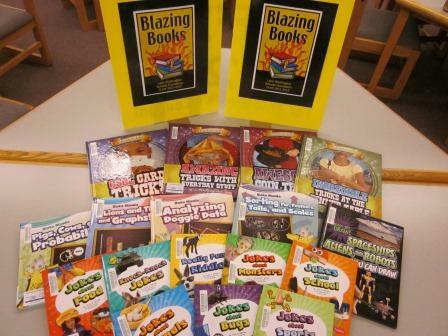 118 new, blazing hot books! 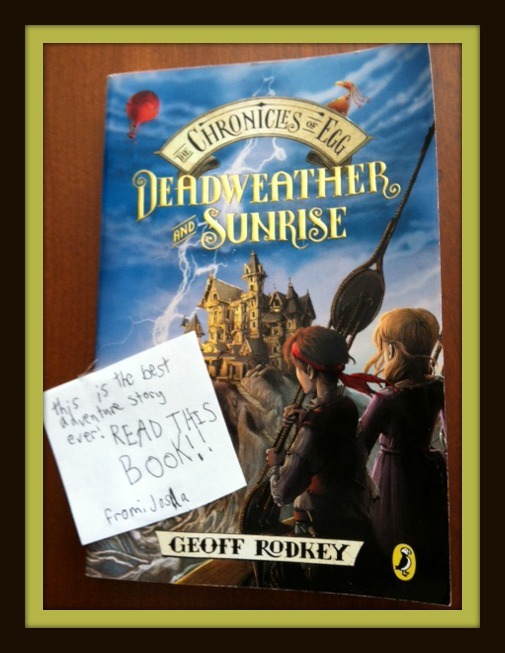 If you are a younger reader, you are going to love, love, love these books! Every new non-fiction book had to pass Mrs. Hembree strict wow criteria questions. Is it a fun book to read? Is it an exciting book to read? 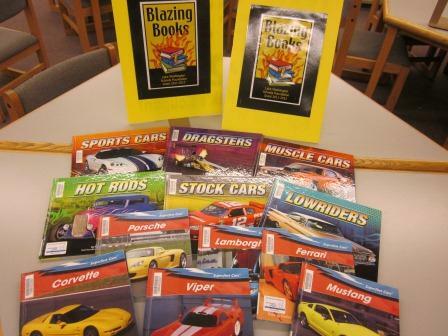 Here are the new car books to select from. No boring books in this group! To go along with our math focus at school, some of the new books are math related. “Crunch, crunch! The farm’s horse loves munching apples. Can you predict which color of apple the horse will eat next? The horse has six red apples and two green apples. So, what do you think the answer is? Find out inside the book Pigs, Cows, and Probability! “What did the bug say after it hit the window? If I had the guts, I would do it again. I also bought a new series called Easy Magic Tricks. These books teach you how to perform magic tricks with playing cards, coins, straws, balloons, and more! There are plenty of ideas here to challenge our budding magicians! Not all of the books are fact or non-fiction books. 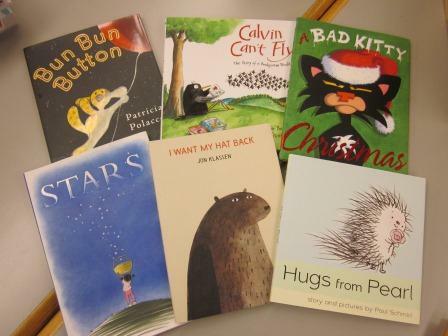 We also have some new everybody picture books for our younger readers. They are housed on a special shelf too! 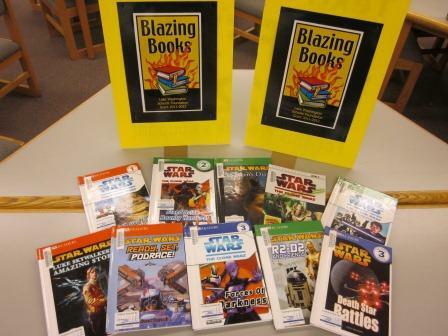 It seems like there are never enough Star Wars books in our library, so look at the new ones we’ve added! This group of books includes early chapter books that are both fun to read and a little bit longer than the usual picture book. These are perfect for our readers who are ready to read chapter books. 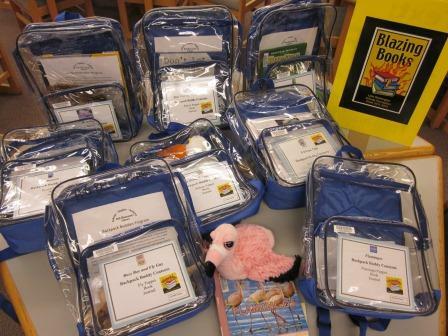 Ten more Backpack Buddies have been added to our expanding Backpack Buddy collection. Inside each backpack is a book, a matching puppet, a journal and instructions on what to do. They are a super fun way to practice reading at home! 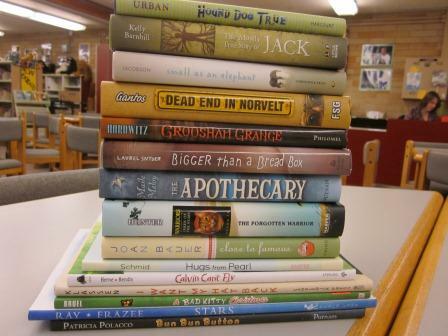 If you check out one of these books from our Bulldog Library, I hope you will let me know what you think about them! You can leave a comment on the blog or you can tell me in person! I am even hoping some people what to give me a review on film with our new Flip cameras! 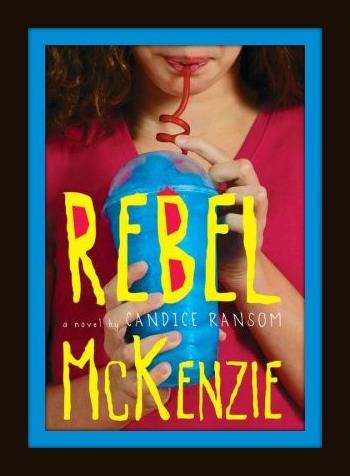 Imagine that….YOU can be a Bulldog Reader Star! 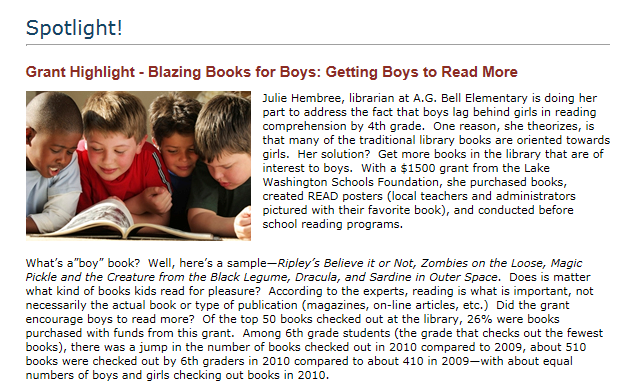 Our LWSF grant is also featured on the Lake Washington Schools Foundation Spotlight page! You can read the full article here. What do you think about our new books? Which ones do you want to check out? Every book has a story. No…not the one between the covers. The story that got you to the book in the first place. Was it a recommendation from a friend? Did you see it on the shelf? Did a librarian hand it to you? 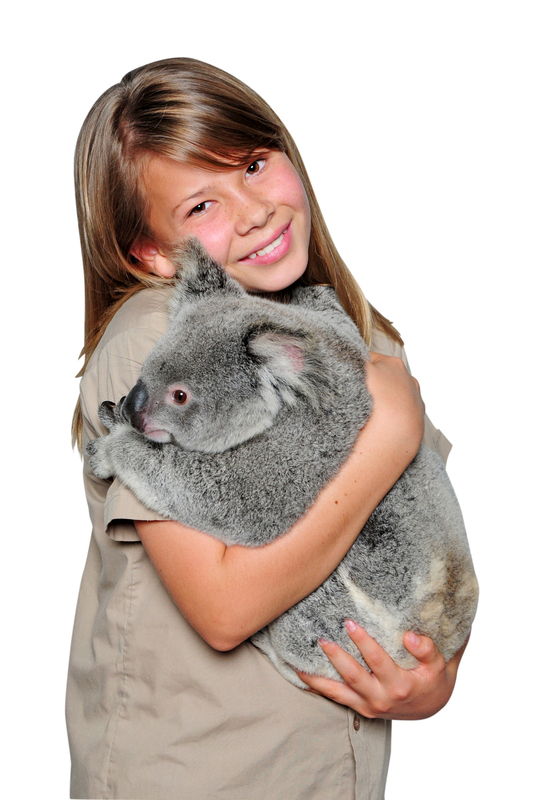 Image provided by and used with written consent of Australia Zoo. My book story began with the Oprah show in January. She brought a plane load of Oprah Fans with her to Australia for an all expense paid trip. I am an Oprah fan too! However, since my invitation to join her in Australia got lost in the mail somehow, I had to watch the shows on television! On the last day, she filmed from the Sidney Opera House and interviewed Terri, Bindi and Robert Irwin. They have carried on Steve Irwin’s legacy at the Australia Zoo- Home of the Crocodile Hunter. 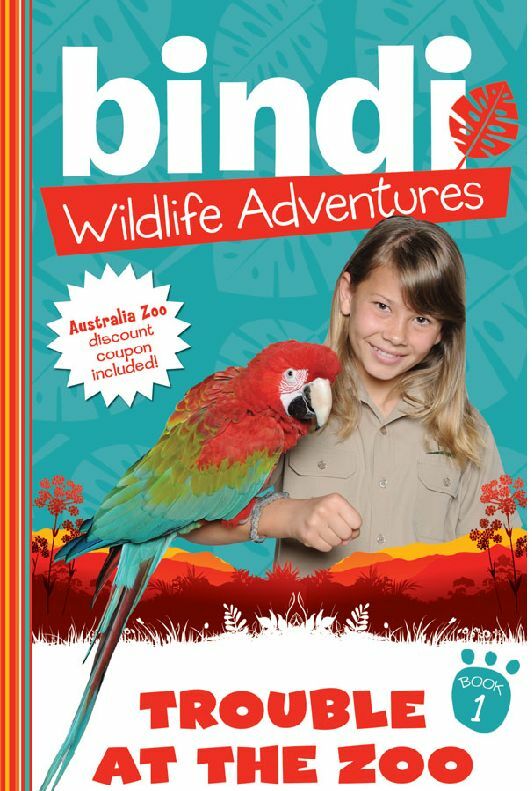 Bindi was talking about her new book series: Bindi Wildlife Adventures. 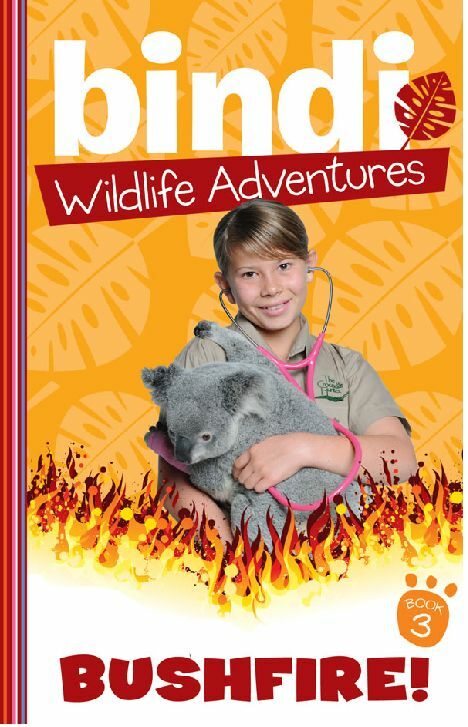 Set in the Australia Zoo, Bindi carries on her father’s love for reptiles and other animals in an adventure book format. It’s a win-win situation for everyone. Kids can read a fun and exciting book, and hopefully lose some of their fear of all things reptile. The Irwins share their knowledge of wildlife conservation with the world. And the Australia Zoo benefits by receiving a portion of the proceeds for each book sold! That’s all it took for me to head for the store and buy a copy for our library. 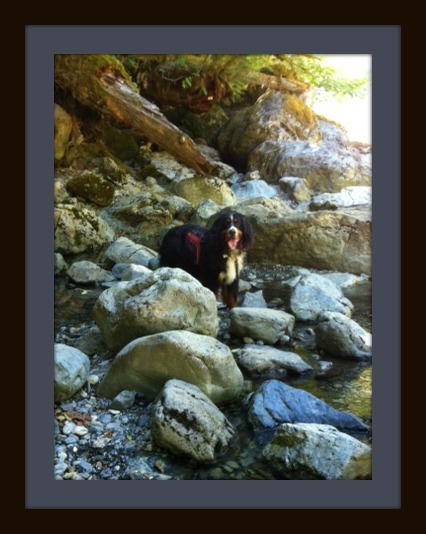 Bindi’s books offer a different kind of adventure story to the chapter book genre. Any book that starts with a girl having a pet Burmese python wake her up, and smiling at the thought ,brings a whole new concept to the idea of an alarm clock! Each story is set at the Australia Zoo and features Bindi, Robert, and their mother Terri. In book 1, Bindi’s birthday party at the zoo is almost spoiled when a 10 year old visitor tries to steal one of the zoo’s water dragons. Can Robert and a very special green macaw save the day and Bindi’s birthday party? You will have to read the book to find out! Animal Fact Files with important facts about the featured animals are included in each book. Including some non-fiction facts with the fictional story is a great way to get kids started in some research of their own. 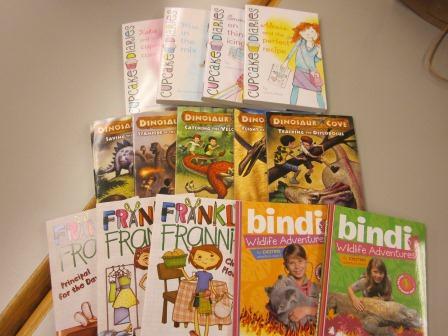 Bindi’s books are appropriate for ages 7+. Check them out! 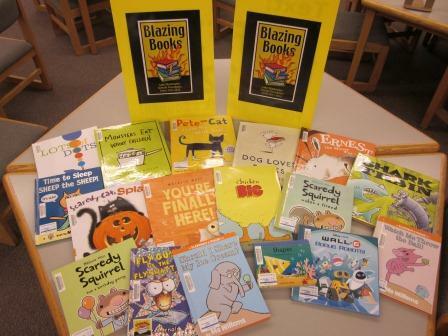 They are a fun addition to any children’s library! 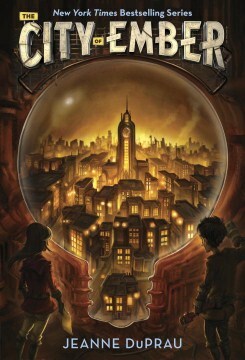 What adventure stories do you like? 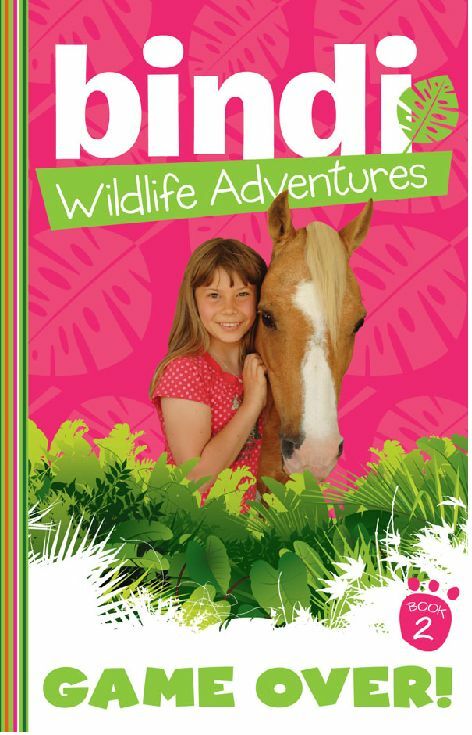 Which Bindi Wildlife Adventures have you read? Do you have a story about how you found a book?